The memorial service for Kelsey Smith was this afternoon. Nick Kastelan, one of the guys in our media department (Saving Grace Productions – SGP), had worked in TV news in Kansas City before joining our staff. He and Peter Metz, our Director of Communications, handled media relations for the visitation last night and the service today. Working with our facilities and security teams, they did an awesome job with the media. They selected a perfect location where the media could have the access they needed without being in the way. They blocked off the street between our two main buildings, making it available exclusively for the TV trucks and other media vehicles. This street is conveniently located outside our backstage entrance, right next to our video control room. SGP generated a live audio/video feed from the output of our audio mixer and video switcher and hooked it to a distribution box in the control room. Each of the TV stations ran their own heavy-duty cables from their truck, along the ground, under the door and into the control room. The complete service video is here. You can see news reports using our video here, here, and here. The family allowed one local reporter inside the building. You can see his report here. SGP also set up a media room backstage where print media people could watch the service on video monitors. We provided power strips and they had access to our guest WiFi. This was an excellent way to handle a very delicate situation. 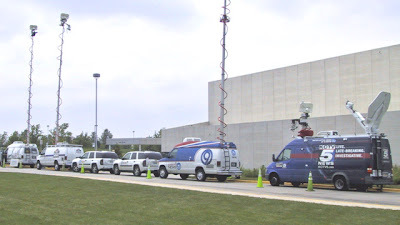 The media were able to get the content they needed without being visible to mourners inside the building. I attended the service myself and never felt I was on display because the only video available to the media was determined by our video director in our control room. Today I saw a very special example of the use of technology in ministry. Props to SGP!